The first ! 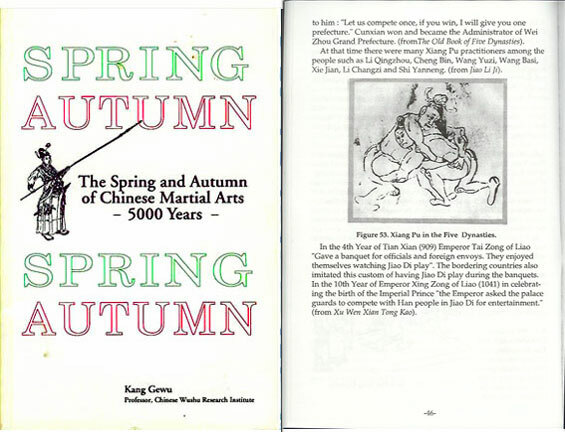 A complete historical reference for Chinese Martial Arts. This book is written by one of the world's leading experts on Wushu. Professor Kang Gewu of the Wushu Research Institute in Beijing has personally traveled throughout China gathering archeological data and oral histories on this valuable cultural treasure that is Martial Arts. This book is a vital text for anyone interested in the origins of such diverse styles as T'ai Ch'i, Shaolin, ancient wrestling and Qi Gong. It offers a time-line that covers thousands of years of significant developments in the long history of Martial Arts. Styles and masters are included by the dozen. The product of years of research and study. Not to be missed! Want to see some excerpts from this book?